New studies suggest that exercise can help your brain to function better and that may have important implications for kids. The Early Show's Dr. Debbye Turner Bell delves further into the topic. According to Bell, researchers are finding that exercise can do more than keep you fit; it can also make you smarter. One school in Illinois has developed a program that gets kids moving and learning. Although it may appear that these kids are working out, they are actually trying to adjust their brains chemistry to maximize their ability to learn. "We're putting kids in P.E. class prior to a classes that they struggle in and what we're doing is we're finding great, great results," said Paul Zientarski, who helps run a learning readiness program at Naperville Central High School in Illinois. The program was started in response to research showing a link between exercise and increased brain function. He says that he has seen the results. "Kids who took P.E. before they took the math class had double the improvement of kids who had P.E. afterward," Zientarski, explained. "Exercise optimizes the brain and the person for learning. It creates the right environment for all of our 100 billion nerve cells up there," said Dr. John Ratey, a professor of psychiatry at the Harvard Medical School and the author of "Spark," a book that examines how our brains change when we exercise. "It produces these growth factors, one of which is call BDNF and I call miracle grow for the brain or brain fertilizer which helps the brain cells stay alive, live longer and it helps the learning process," Ratey said. Ratey cites studies showing that exercise promotes the growth of new cells in the hippocampus, an area in the brain associated with memory and learning. "Exercise promotes more than anything else we know the growth of new brain cells," Ratey said. Naperville Central High School has embraced the idea that working out helps a child learn. There you can find exercise equipment in some classrooms. "Their bodies are moving and their brains are thinking and they're engaged - not sitting still trying to memorize something," said Maxyne Kozil, a reading teacher, who believes that kids learn best when they're moving. An example of this is having a student work on her vocabulary while standing on balance boards. "They say having to balance actually helps them to concentrate even better," Kozil said. "When you heard about this concept of moving while learning, were you skeptical at all?" Turner asked Kozil. "Not at all,' Kozil said. "It was logical to me. I know it's how I learn best - if I'm energized, I'm ready to go. And it makes sense not to have the students sitting for such a long period of time. Getting them up and moving gets them energized, focused better, paying attention better." In their math classes students rarely zone out because every so often they take a "brain break." 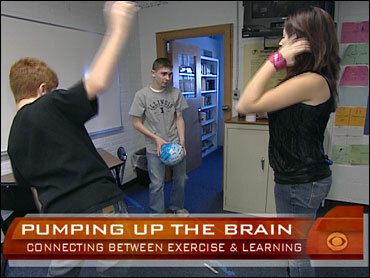 "Brain breaks" are interactive games that get kids up and out of their seats. "You know when I got into teaching they told me don't let the kids out of their desk because there could be problems," said Dave Sladkey, a math teacher. "So, now its move them out of their desk, they need to move they need to get up and around to get their brain going." Rather than wearing them out, kids say that exercising before class and moving during class makes the school work seem easier. "If you go out and you go for a run and then you read, it's a lot easier to read because you feel more awake," said student Dominic Traver. "I feel more focused because I just did something that makes me focus more," said student Jessica Terry. "What's ironic is that some schools have cut back on P.E. in favor of academics when actually research is showing that physical exercise is exactly what kids need in order to excel," Bell said.